Luxury romantic Finca in the Güimar Valley, located on the beautiful 'Barranco de Badajoz' with wonderful sea views and to the mountains. On the property of 2.500 m2 you will find apart from the residential area and the pool, several terraces and gardens with tropical fruit trees and fresh vegetables and a house wine production. The living areas consists of a main building with a large covered and furnished terrace with table tennis overlooking the sea, and a small terrace with a fountain, with an additional toilet. From the main terrace you enter into a large common room, where you will find a fully fitted kitchen, a barbecue, a combined billiard and hockey table and a small bar. A comfortable living and dining area is separated by a door. An outside staircase leads to a terrace of 30 m2 with a beautiful mountain view and to the absolute highlight of this country house, the master bedroom. There you will find a large (1.80 x 2.00 m) double bed, a jacuzzi, a minibar, a 50-inch television with SAT-TV and home cinema, CD, radio, air conditioning and a fireplace. An open bathroom with shower is also located by the bedroom. In a separate building with a front terrace of about 12 m2 is another living area or bedroom as it has a sofa bed for 2 persons. There is also a desk and a muscle training machine. Between the two living areas is a typical Canarian Bodega located, where you can taste the own house wine. The pool area is built protected from the wind and has 2 modern hanging sun beds and 2 teak sun beds. Also you will find a chill-out area, a small and open wood cabin with two hanging seat baskets and wonderful sea views and to the mountains. The access to the property is by a private driveway. The location is very quiet and ideal for relaxation and recreation. Privacy is guaranteed, because the nearest neighbor is about 500 m away. Hikers can enjoy several routes starting from the property in and around the famous “Barranco de Badajoz” with its unique nature. It is an ideal place for an individual holiday in a very mild climate and far away from the mass tourism.The city center of Güimar is about 2 km away, where you will find an extensive selection of shops, supermarkets, bars and restaurants. In about 15 min. drive you reach El Puertito de Güimar, that offers tasty local fish restaurants, a large black sand beach with a promenade and some shops. Special location - so tranquil - we loved it! A very relaxing holiday. We will be back! The Finca is exactly as described and had everything you need, the owner Pedro was very helpful although spoke very little English. Overall we were pleased with the accommodation. The finish is not as good as it could be, some of the wall coverings are falling off in the bedroom (not really a problem, but it does allow the local lizards to hide there in an evening) the electrical supply is a bit uneven (using some sockets prevented the freezer working as an example) and we had some difficulty re-lighting the boiler as the pilot light kept blowing out in the wind !! However, these things are only to be expected in such a remote setting. 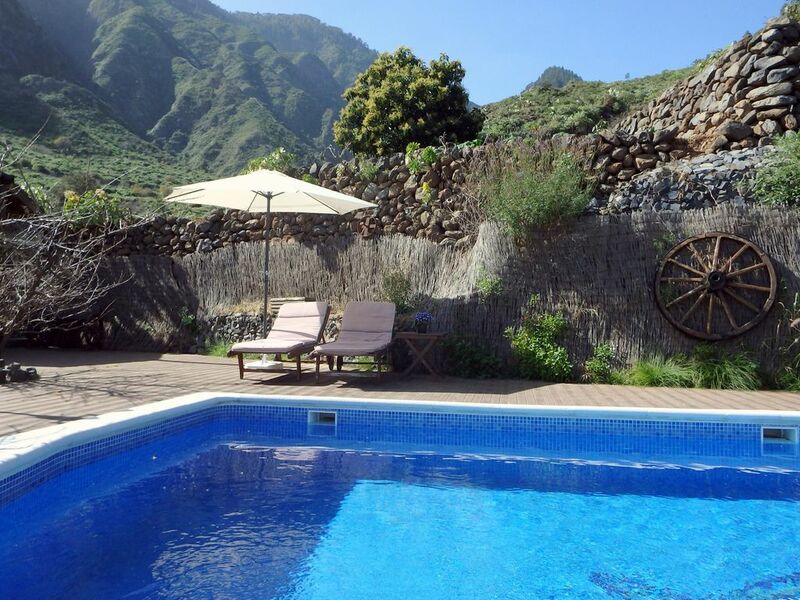 The finca is about 20 minutes from Guimar up an unmade road, so as long as you are looking for a quiet retreat it is perfect, however, this does prevent easy and quick access to any shops or restaurants. Thanks very much for your review and we hope to see you again in the future! Excellent place to relax and enjoy the location. Just spent a superb week at this unusual property. The description was spot on, it was well maintained, clean, and had everything you need. The only reason I didn't give it 5 stars is that it was a difficult journey from Guimar. But only because the easy route was closed due to damage to the road after the storm in Dec '13. I would like to return again and would definitely recommend this property to anyone. The owner Pedro was very friendly and arrived promptly to sort out a couple of very minor things. Thanks for the use of your wonderful Finca ! Die Finca ist wubderschön in den Häbgen von Guimar gelegen. Es gibt viel Platz und einen schönen Pool (Wasser war leider zu kalt). Die Küche ist etwas nager ausgestattet und in den Räumen ist es sehr dunkel, man braucht auch bei Tag Licht. Die Abdahrt ist sehr steil auf unebenen Wegen. Ein 4x4 ist unbedingt zu emofehlen. Alles in allem aber eine sehr schöne Finca iseal zum Erholen und auch für Ausflüge in die Ungebung. Wir haben als Familie (19,23,53,61 Jahre) diese Finca gemietet um in schöner Natur einige Tage zu verbringen. Pedro und seine Frau haben uns toll betreut und uns vor allem erstmal den Weg zur Finca gezeigt, und das mitten in der Nacht um 1.00Uhr. Das ist dringend erforderlich, denn die Finca ist so abgelegen, dass sie ohne Hilfe mit Sicherheit nicht zu finden ist. Wichtig zu wissen ist, dass ohne entsprechendes Auto ( am besten geländetauglich!) , das Grundstück nicht erreichbar ist, sprich nur mit öffentlichen Verkehrsmitteln wäre man total aufgeschmissen! Auch sollte man ein guter und sicherer Autofahrer sein, denn die Anfahrt ist extrem steil, eng und teilweise auf Schotter zu bewältigen! Hat man das alles geschafft, erwartet einen eine unglaublich schöne Umgebung inmitten eines Bergmassivs mit tollem Blick Richtung Meer, dessen Entfernung aber nicht zu unterschätzen ist. Die Finca ist ein Traum, für alle genügend Platz und Rückzugsmöglichkeiten - aber auch viele Gemeinschaftsflächen, die zum Essen, Feiern und Spielen einladen. Wunderschön ist auch der kleine aber völlig ausreichende Pool - an dem man sich prima entspannen kann! Insgesamt hatten wir eine super Zeit - die Insel ist sehr vielseitig und das Straßennetz, insbesondere die Autobahn, die dreiviertel der Insel umspannt ist sehr gut ausgebaut. Ein Highlight ist mit Sicherheit der Teide und der Nationalpark - ein absolutes Muss und eine unheimlich beeindruckende Landschaft. The lively small town with about 16.000 inhabitants is one of the oldest communes of Tenerife and is located in a valley that is mainly dedicated to the production of tropical fruits. The southern and stable climate makes this particular type of fruit quality, which is increasingly exported to foreign countries. Among the traditional buildings are the two churches from the 17th Century, particularly the Iglesia del Convento de Santo Domingo. A cozy Plaza invites you to linger. The hospitality is felt everywhere and the local cuisine can be highly recommended. A visit to the bars and restaurants with typical Canarian cuisine is highly advisable. In the backcountry yo will find the famous 'Barranco de Badajoz' with countless hiking trails. In the ethnographic park 'Pirámides Güimar' can visit the stepped pyramids of Guimar, the Norwegian anthropologist Thor Heyerdahl in 1991, researched and found it similar in style to other pyramids in Mexico, Peru and Mesopotamia. A museum offers information on various theories on the origin and migration of ancient civilizations. In just a few minutes you reach El Puertito de Guimar, a small coastal town with a newly built sandy beach and promenade. The village is well maintained and very touristy yet untapped. Many native fish restaurants serving at local prices. Approx. 27 km south you will find the island's capital, Santa Cruz with a rich cultural life. The rental price is for 2 people. Additional persons pays each an extra fee of 10 € per day. Final cleaning has to be paid by arrival - 80 €.